Skin cancer is the most common form of cancer in humans, with approximately 5 million cases each year in the United States. Skin cancer is the result of the abnormal growth of skin cells. It can occur anywhere on the body, but most frequently appears on skin that is exposed to the sun, such as the head and neck. There are three major types of skin cancer, basal cell carcinoma (BCC), squamous cell carcinoma (SCC), and melanoma. Basal cell carcinoma is the most common type of skin cancer in humans, accounting for approximately 3.5 million cases each year. Fortunately, BCCs do not often spread to other parts of the body, but if left to grow, they can become very large and affect quality of life in significant ways. There is evidence that intermittent, intense sun exposure, such as getting a bad sunburn each year on vacation, is related to the development of basal cell carcinoma. Early detection and prompt treatment are important in order to optimize the chances of cure. Basal cell carcinomas usually look like a pink, pearly bump. Sometimes they can have a small scab or bleed with minimal scratching. Many patients think that they look like a small acne bump that does not go away. Squamous cell carcinoma is the second most common type of skin cancer, with approximately 1.5 million cases each year in the United States. 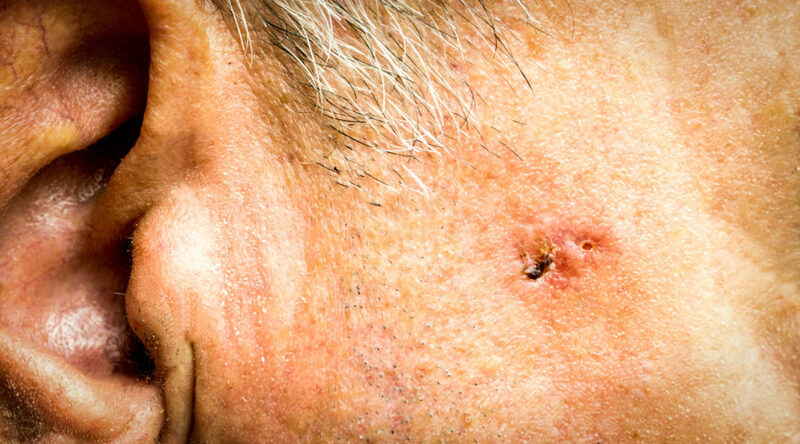 Like basal cell carcinoma, it usually occurs in sun-exposed areas such as the head and neck. There is evidence that chronic, daily sun exposure is related to the development of squamous cell carcinoma. While squamous cell carcinoma does not usually spread to other parts of the body (usually <5%), it has a higher risk of spreading than basal cell carcinoma. Squamous cell carcinomas on certain locations on the body, such as the ear or lip, or which travel along nerves, have a higher risk of spreading. Like other forms of skin cancer, early detection and treatment of squamous cell carcinoma is important for successful treatment. Squamous cell carcinomas can often be a firm, crusty bump, and can grow slowly or quickly. Fortunately, most squamous cell carcinomas can be easily treated through a variety of methods with excellent cure rates. Dr. Jensen can help you choose the most appropriate treatment for you. Among the three most common types of skin cancer, melanoma is the most aggressive type of cancer, and the most likely to spread to other parts of the body. Melanoma is responsible for over 10,000 deaths in the United States each year, which accounts for ~80% of all skin cancer-related deaths. There is evidence that ultraviolet-A rays, such as those found in tanning beds, are at least partially responsible for the development of melanoma skin cancer. 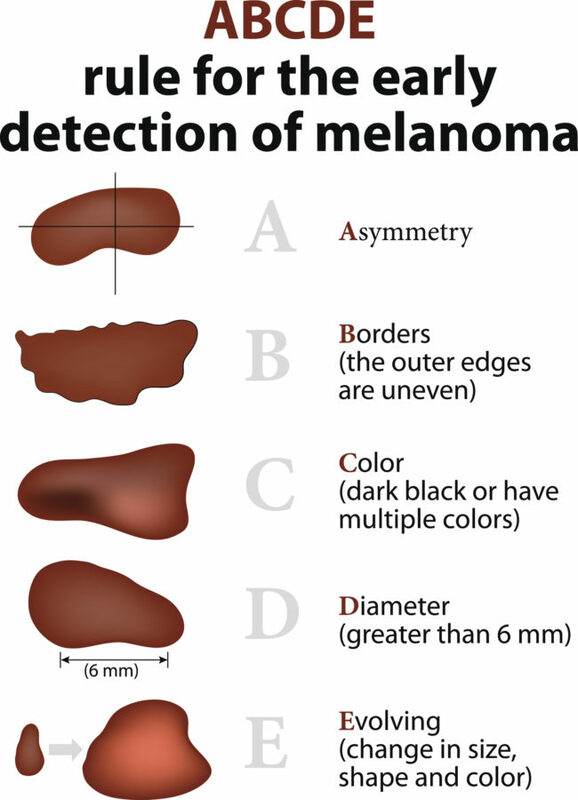 The majority of melanomas are black or brown, but they can also be skin-colored, pink, red, purple, blue or white. 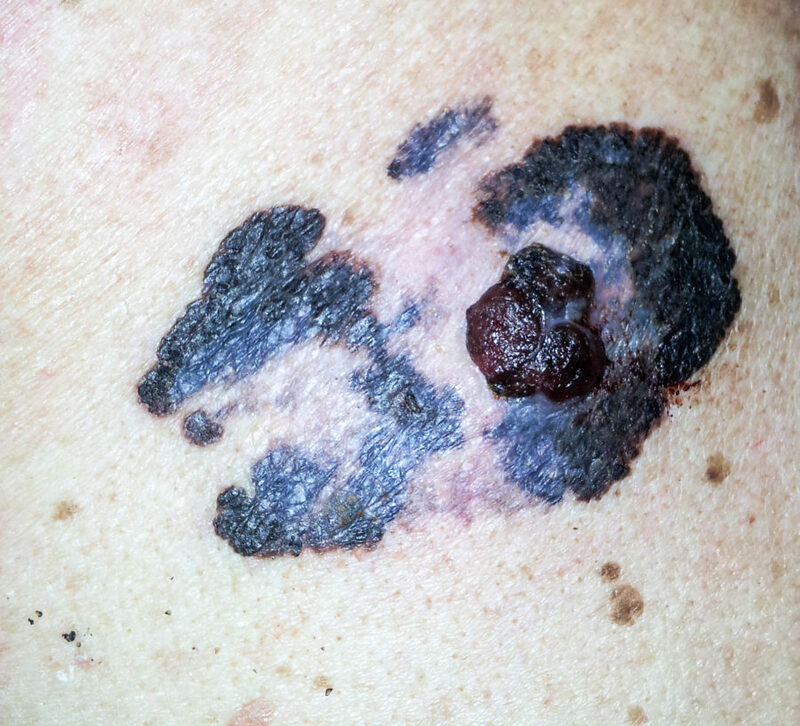 During later stages, a melanoma may itch or bleed. If a melanoma is diagnosed and treated in its early stages, it is often curable; however, during later stages, it can rapidly spread to other parts of the body, become hard to treat, and possibly be fatal. If you are worried about any of your moles, please get it checked promptly. Let our office know that this is the reason for your visit and we will try to get you in as soon as possible. Many skin cancers are found on routine skin checks performed in the office. A skin check is a simple examination where Dr. Jensen checks your skin for any unusual growths. If you have any worrisome spots, or spots that you wonder about, please feel free to point them out at your appointment. We want all of our patients to have their questions answered and to feel confident that they were thoroughly checked. 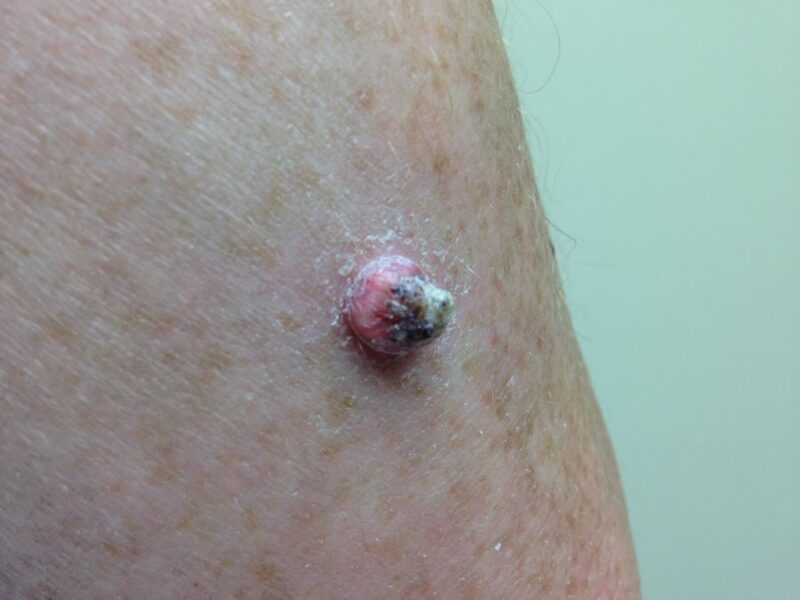 If skin cancer is suspected, Dr. Jensen may recommend a simple biopsy to determine if the spot is a skin cancer. While a biopsy can cause some patients anxiety, we make every effort to help our patients feel comfortable. Most patients are surprised at how easy a biopsy is. Once the results of the biopsy are reviewed by a dermatopathologist (a pathologist who specializes in skin disease), the type of cancer can be determined, and a treatment plan can be created. Many patients wonder if a biopsy can adequately treat their skin cancer and if further treatment is necessary. In general, a skin cancer will not be treated adequately by a biopsy, as there are often microscopic skin cancer cells that remain. The purpose of a biopsy is to find out what something is (i.e., what kind of skin cancer it is) so that it can be treated correctly. Depending on the stage, type and severity of the skin cancer, chemotherapy and radiation may be recommended in addition to surgical removal. Dr. Jensen has extensive training and experience in the management of skin cancers of all types and complexity. He is happy to sit down with you to discuss your skin cancer, the treatment options available, and work with you to make a plan that fits your goals. Unfortunately, not every skin cancer can be prevented. However, there are some simple things that you can do to minimize your risk over time. We recommend limiting sun exposure, especially between 10 AM and 4 PM, when the sun’s ultraviolet rays are most intense. Remember, you get an extra dose of ultraviolet light at high altitude and when you are around water, sand and snow (from the reflection of the light). We recommend SPF 30 or higher. There are a variety of face moisturizers, make-ups, and non-greasy sunscreens that can be used on a daily basis. Make sure to apply to the face, ears, neck, upper chest (especially for women with low-cut necklines), and hands. Clarity Dermatology carries several lines of nice sunscreen that feel light on the skin and which offer excellent ultraviolet protection. A hat can provide extra protection against UV rays. Hats are particularly important if you have thinning hair, as the sun is particularly hard on the scalp and can cause numerous precancers and skin cancers. Glasses with frames that fit snuggly around the eyes are ideal. This will keep light from entering the eyes from around the edges of the glasses frames. Wearing sunglasses also cuts down on squinting, which is a major cause of wrinkles around the eyes. Clothes with a UPF (Ultraviolet Protection Factor) have a tight weave, and sometimes other additives, to protect the skin, just like sunscreen. These are particularly common in sporting attire and can be found in many stores and online. We can help you find UPF-rated clothing, if you would like more information. Tanning beds use ultraviolet-A (UVA) light to induce the tanning response in the skin. UVA rays not only cause premature aging of the skin, but more importantly, there is growing evidence that UVA exposure is linked to the development of melanoma. Spray tans and sunless tanners offer a safe way to get that “glow,” if desired. For patients who have had a number of skin cancers, it is worth considering taking niacinamide (also known as nicotinamide). A recent study in the New England Journal of Medicine demonstrated that taking this vitamin supplement (500 mg twice daily) could decrease the number of skin cancers you get by 20-30%. While this vitamin can be found over the counter, Clarity Dermatology also stocks this vitamin in clinic for your convenience. Please ask Dr. Jensen or one of our staff if this may be a valuable addition to your skin cancer prevention routine. Performing routine self-exams to spot skin changes, and seeing a dermatologist for a full-body screening on a regular basis, are also recommended. If you want to monitor a mole in between dermatology appointments, we recommend taking a close photograph with a camera (the camera on most cell phones is one excellent option). You may take photographs every 1-3 months, and if you notice any changes, please call our office to schedule an appointment, even if you are not due.